Why is fast food a pejorative? It carries the perception of mediocrity, as food for people of a lower social standing, and I’ve always found that unfair and classist. Truth is, that a restaurant could expeditiously serve a fried chicken with the consistency and quality of Popeye’s—even if it’s been sitting under a heating lamp—is remarkable. We conflate the ready availability of a food as sign of cookie cutter-mediocrity, when in fact, no one has engineered a better French fry than McDonald’s. Burgers are a trickier beast for chains to nail successfully. With very few exceptions (In-N-Out for fast food, Steak ‘n Shake and Fuddruckers for casual sit-down), it is difficult to produce a burger on a national scale that is universally beloved. Unlike fried chicken or fries, the burger is the sum of its components. It is a blank canvas that allows chefs to flex their creative muscles, and when you’re a restaurant that doesn’t have thousands of locations to serve, you generally have access to higher quality ingredients—better beef and cheeses, more inventive toppings and sauces. One notable exception. For six weeks earlier this fall, there was what I considered the finest fast food burger extant: Wendy’s Giant Junior Bacon Cheeseburger. 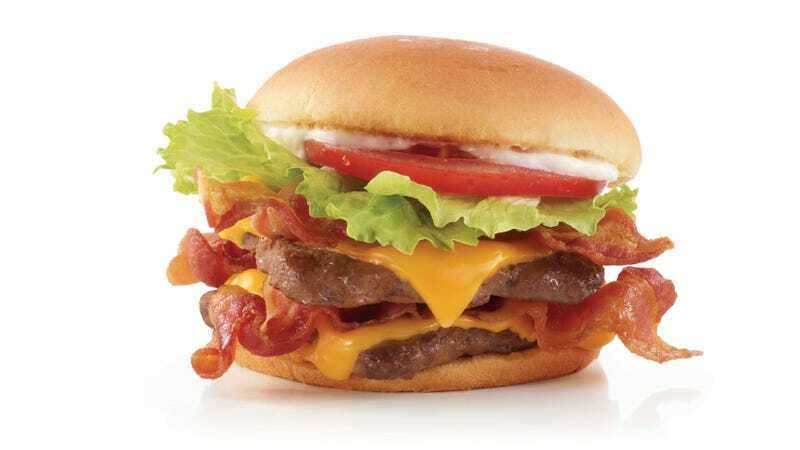 Its origins come from Wendy’s original Junior Bacon Cheeseburger, among the top tier of the sub-$2 burgers. Several things set the JBC—introduced in 1989—apart from its peers. There are several layers of crunch, imparted by the lettuce and bacon, which makes this not texturally monotone like the vast majority of chain burgers. Secondly: Beneath the beef and cheese, I’ve always enjoyed the straightforwardness of the secondary flavors, that of bacon and mayonnaise. In other burgers I’m a fan of the counterpoint bite that pickles, relish, and mustard provide, but I love that the JBC is void of those qualities, opting instead for a simple flavor profile more savory, smoky and rich. But what has always kept the JBC from being a perfect fast food burger comes down to its component ratio. The buns—I’ve always found its steamier-than-usual texture appealing—is out of proportion to the scant sliver of beef patty provided. It is slightly too bready, too bun-reliant. Wendy’s remedied the problem this past August with the introduction of the Giant Junior Bacon Cheeseburger on its limited-time-offer menu. This burger essentially doubled the proteins while using the same bun: twice the beef, American cheese, and bacon. Forget that there’s a certain shame ordering a food with “giant” in its name, this was a reasonably sized burger—more satiating than Wendy’s lower-end burgers, less guilt-inducing than a cholesterol bomb like the Baconator. For me, the Giant Junior Bacon Cheeseburger was a flawless sandwich, more so that it cost under $3. There was one weekend where I consumed four over a 24-hour period. But notice my use of past tense throughout this piece. It is because Wendy’s took if off the menu after about six weeks, though I’ve been told more liberally minded locations will customize the standard JBC. Perhaps this will achieve the secretive lure of In-N-Out’s Double-Double Animal Style—not on the printed menu, but understood implicitly by those in the know, both behind and in front of the counter, as the superior option.